Bolo de Milho: Gluten Free Corn "Cake"
Season 2 cups of corn meal (best with precooked coarse corn meal) with salt to taste and pour in water until it is damp (do not over-soak). Leave the corn meal covered in a warm place for at least 20 minutes (it can be up to 8 hours). Sprinkle this wet mixture in a proper steam cooking pan such that the steam will go through the cake - you may otherwise put them in small ceramic bowls, cover with a dish and microwave cook them for a minute or so (they are upside down) to bake individual portions. After cooking: invert onto a plate, remove the bowl and serve immediately with butter, scrambled eggs, cheese, any kind of minced meat, or even hot milk, at any meal! You may also scramble the leftovers and stir fry with a little cooking oil and herbs for a perfect accompanying dish for moist food such as soup or stew. It may also be cooked with other ingredients in the cake: diced cheese, bananas, vegetables etc. 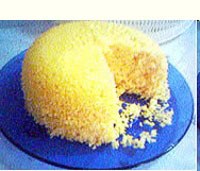 Please let us know if you've tried Bolo de Milho and how you liked it. – Click here to read or post comments. This looks really good, can't wait to try it. I recently bought some pre-cooked masa from a Latino market for my arepa maker , so I will be giving this a try soon. Thanks so much for submitting the recipe! Join in and write your own page! It's easy to do. How? Simply click here to return to Gluten Free Side Starch Recipes.